Jewel in the Crown slot is a 5 reel and 10+3 payline game by Scientific Games. Themed on the famous crown jewels, the slot grid is set on a crown where loads of action are set to take place. 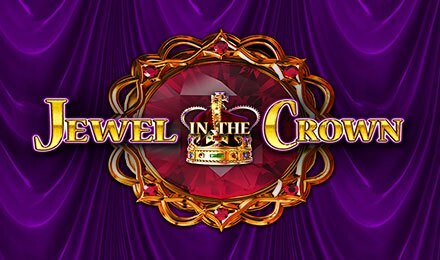 Jewel in the Crown slot is now featured at Vegas Spins Casino, and has loads of features and bonus rounds in store for you! Launch on your mobile, desktop or tablet and enjoy the possible big wins! On the reels, symbols you will find are; a selection of jewels and low paying cards such as; A, K, Q, J and 10. When you’ve activated Jewel in the Crown slot at Vegas Spins, set your stakes on the Stake/Line Field using the + or – buttons. BB is another option in the game, which allows you to trigger the Big Bet feature! Autoplay is at hand, and allows you to set several auto spins to play! Amount of Paylines Selection: Paylines vary, and you may select from 1 to 10. In certain features, they change to All Wins Pay. Coin Values: Set your stakes from the min bet £0.10 to the max bet of £500.00. The wild of the game takes form of the WILD. This replaces all other symbols bar the scatter symbol. The scatter is the Crown, which triggers the Free Spins Feature. Land three, four or five Crown symbols anywhere on reels 2, 3 and 4 and activate this feature. When triggered, 8 free spins are awarded. Blue Crown then become Wild and Red Crown becomes Mega Stacked. Any bet above £2.00 increases the paylines amount from 10+3 to All Wins Pay. Here, adjacent symbols on a payline award winning combinations from either side of the reel. Level 1: £20.00 Big Bet - Crowning Glory Trail Bonus is activated. Level 2: £30.00 Big Bet - Crowning Glory Trail + All stacked symbols are jewels. Level 3: £50.00 Big Bet - Super Crowning Glory Trail + All stacked symbols are jewels. The Crowning Glory Trail Feature involves collecting crown bonus symbols for five spins which are then added to the meter above the reels. Collect five or six of them and receive 8 to 16 spins to play. In the Super Crowning Glory feature, collect 3 crowns and receive 16 spins to play.